On Tuesday, Chanel Couture transformed the glass-roofed Grand Palais in Paris into an oasis that included a three-story wooden pavilion, a lush green lawn, trees, and floating lily ponds. A picture of calm, the scene offered the perfect backdrop for the French luxury house's lineup of ecologically inspired floaty dresses, tweed jackets, embroidered blouses, and pencil skirts. The neutral palette (ecru, ivory, sand, and taupe) only heightened the au naturel feel of the collection, which incorporated earthy materials such as wood chips, "wild cotton," cork, linen, hemp, raffia, and recycled paper straw. Creative director Karl Lagerfeld described the aesthetic as "high-fashion ecology." All the paillettes and beaded embellishments were created in-house. “We had to make everything because there are no sequins in wood,” Lagerfeld said. “We’re in fashion and at the moment ecology is part of the expression of our time, what fashion is supposed to be,” he added. It’s a remarkable turnaround for the German designer, who once mused out loud if global warming was “maybe all nonsense”—after flying in a 265-ton glacier from northern Sweden for a show, that is. Tokenism or not, the collection had people talking, which was precisely the point. Still, Lagerfeld couldn’t resist at least one dig at the activist crowd. “Sustainable fashion shouldn’t look like some sloppy, demonstration stuff,” he quipped. My question is : Did he really use eco-friendly materials or he just used wood chips from any tree and x plant-based materials to decorate this collection and then he just said that it is for the ecology? Because I am a fashion design student and for my thesis I am working on something similar with organic fabrics and natural dyes and this Chanel collection really confused me and all my classmates. As soon as they saw it they came to me to show me that Chanel is not eco-friendly... https://www.gofundme.com/veganthesis (my idea) So it is just words or they really tried to make something more sustainable? “I liked the idea to take ecology one step further and to make a high fashion, very elegant and very luxurious version of it," he added. All the paillettes and beaded embellishments were created in-house. "We had to make everything because there are no sequins in wood," Lagerfeld said. There were other nods to nature, as well. Birds and bees made appearances whether embroidered onto tulle or mounted onto jewelry. 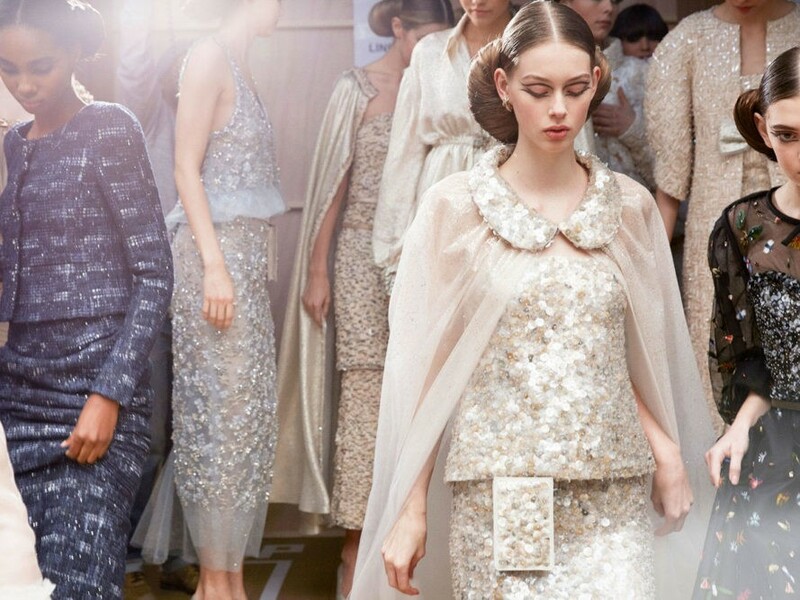 Everything was, in Lagerfeld's words, "very pure, very Zen." "We're in fashion and at the moment ecology is part of the expression of our time, what fashion is supposed to be," he said. It's a remarkable turnaround for the German designer, who once mused out loud if global warming was "maybe all nonsense"—after flying in a 265-ton glacier from northern Sweden for a show, that is. Still Lagerfeld couldn't resist at least one dig at the activist crowd. "Sustainable fashion shouldn’t look like some sloppy, demonstration stuff," he quipped.